prepped for pedicure season quite yet. and I couldn’t be happier to see my friend as a newlywed Mrs.! What do you plan to wear for this year’s wedding season? I need to get those flats! And those earrings! Cute look! Thanks, Jenn! It was so fun! Lol, that's a good way to look at it! That was my whole reasoning in wearing flats – heels would've been off in five minutes! Thanks, girl! It was a last-minute decision to add the mint cardigan, but I'm so glad that I did. Consider yourself lucky with no weddings to attend – we are getting burnt out from them! Awe! I don't have that specific one – I wore my diamond heart pendant from Jared that Ryan got me on our first dating anniversary. 🙂 The flats look just like the Chloe ones, and they are super comfy, too! Thanks, girl! Trust me – I threw this outfit together the day that we were leaving for the wedding. Typical! 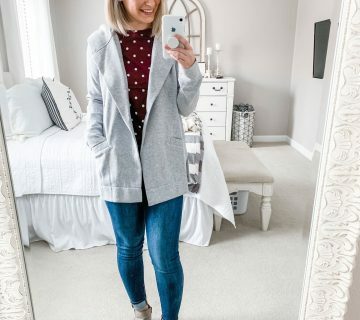 I agree about Old Navy – it's basically my go-to for shopping these days! I don't have a mini Mac, but I'd sure like th one that I included here! I thought so, it ended up being a good combo! Those aren't the actual earrings that I wore, but now I want them! Yes, absolutely! It's pretty versatile that way. This outfit could work for so many events! I have those earrings in another color and wear them all the time! Such a cute outfit you put together, perfect for the wedding or any other Spring/Summer event! 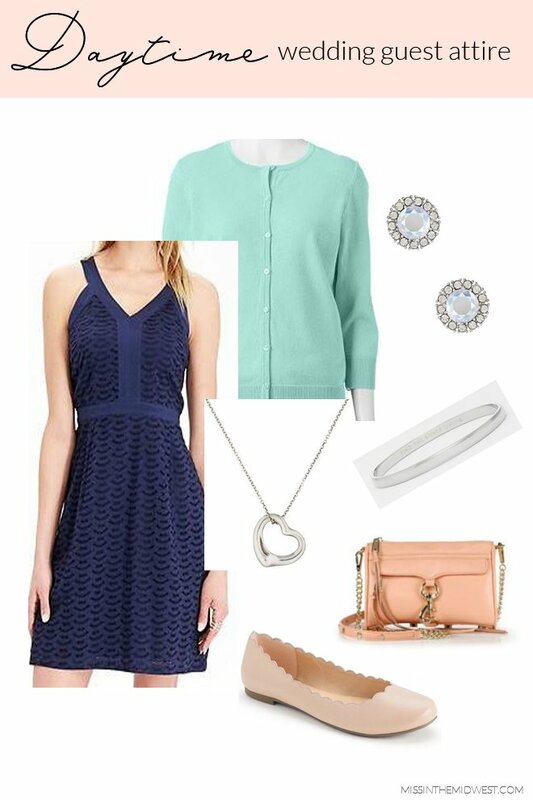 The mint cardigan with the blue dress is such a pretty combo! I love that dress! Seriously Old Navy has really been stepping it up! I want to get a light colored mini mac for the Summer! Big fan of the color combo! I have a wedding to attend Friday night and I have NO idea what I'm going to wear… procrastination at it's best! That Tiffany's necklace is the first gift Nick ever gave me! 🙂 Love this look – a sundress + cardigan is the perfect solution for a day time wedding. And yes to those flats, they remind me of the Chloe ones! 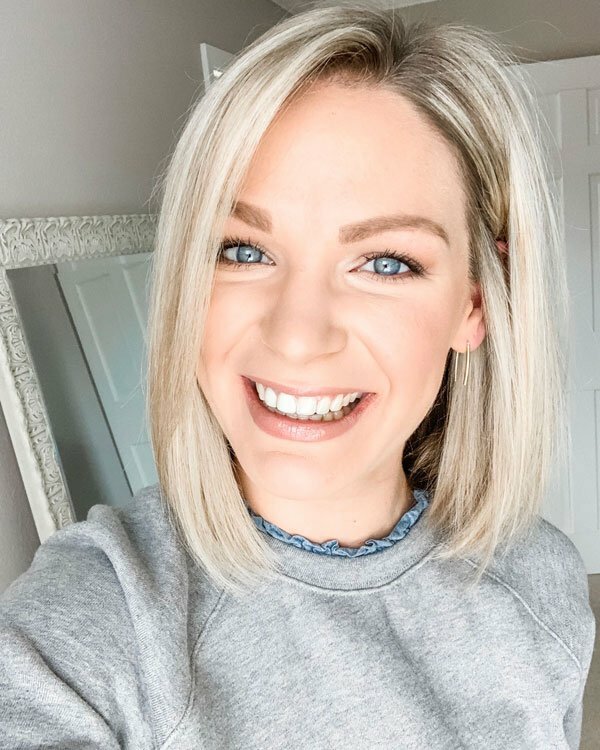 Love the casual spring time look – I actually don't think we have any weddings this year! Though there are still plenty of dress up occasions I have for work where I have to figure out how to dress this bump! 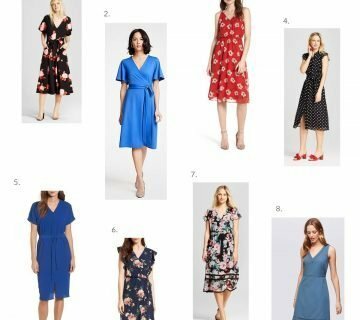 Day time weddings can be so tough for outfit picks!! I'm really loving navy lately and I love the combo with the mint! Great picks! Love those scalloped flats. So cute! love this dress. I never know what to wear to a day wedding. Also, love that you paired it with flats-I always end up kicking off my heels anyway! I love the mint and navy color combination – very cute! Love the look! So glad you had a good time at the wedding despite the icky weather! That dress is so pretty! 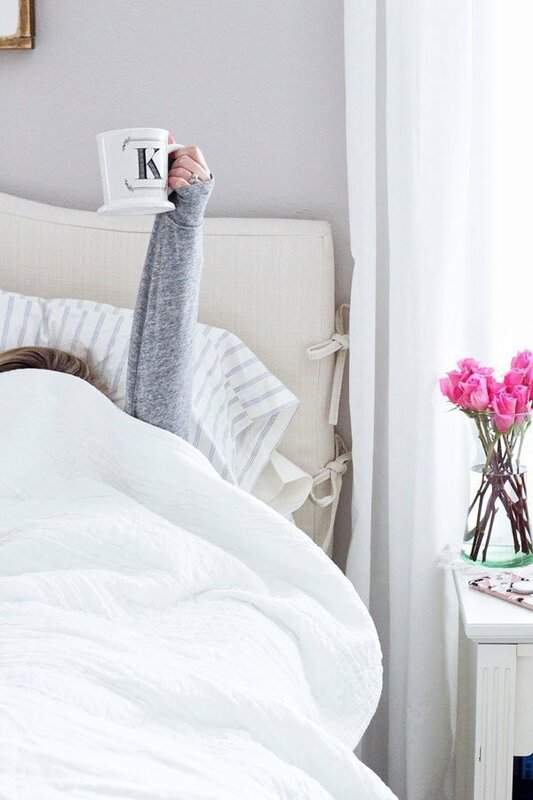 And loving those flats! The scalloped edges are so cute! Great look!